Shortly after Louis Marie de Schryver’s birth, the Impressionists began using the life of Paris for their artistic compositions. 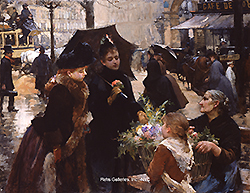 Everyday life of Paris was not a new subject, but what was introduced during the latter half of the nineteenth century was a growing interest in its fashionable streets and the city people who wandered through them. As the century came to a close, fashionable cafes, large-scale department stores, and World’s Fairs, such as that of 1900, invited Parisians to step outside of their homes and interact with one another in the fashionable and creative center of the arts. Artists, such as Louis Marie de Schryver, became intrigued by the life along the streets and certainly with the fashionable upper society. 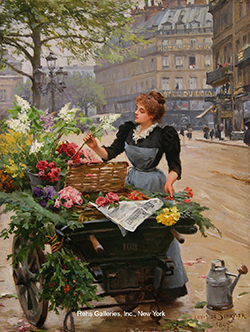 Louis Marie de Schryver was born in Paris on October 12, 1862. His father was a well-established journalist, but his son did not follow the same path. From an extremely young age de Schryver recognized his precocious artistic capacities and began training for his career as an artist by twelve. He was so talented that he exhibited his first works at the Salon (1876) at the age of thirteen: Marguerites et Chrysanthèmes (Marguerites and Chrysanthemums) and Violettes et Fleurs Printanières (Violets and Spring Flowers), two still life paintings. What is perhaps even more unusual was that at this time, he was apparently not studying under any master – his entry in the Salon catalog does not denote any specific teacher, though he may have been informally studying under an artist. By 1891, de Schryver had entered the atelier of Gabriel Ferrier (1847-1914), a genre and still life painter, after having taken a substantial hiatus from formal training. To this year’s Salon, he exhibited one painting entitled La Fin d’une Rêve (The End of a Dream), which earned him a third-class medal, his first medal received at the Parisian Salons. These works also were linked to the increasing interest in photography during the period, which could capture what would not be discernible to the naked eye. Artists began using photography more and more not only for models, but also to pique their interest in the physical action, that could now be documented and studied. 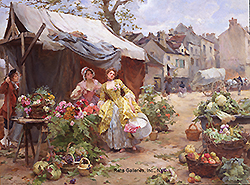 Many of Schryver’s automobile works were captured in a more impressionistic style with beautiful color and quick brushstrokes, but he found little acceptance for them in the marketplace. By 1910, for financial reasons, he returned to his successful images of Paris at the turn of the century.